I took the photo of this wonderful fellow full of stories in San Miguel, I would like to know if his personality came across and if you would change anything. I am keeping it short because I don't know if I will be able to post the picture. It works for me. He has a twinkle in his eye and a sly smile that suggests he really enjoys interacting with customers and tourists and probably anybody who is willing to chat with him. I wouldn't change a thing. Overall I like the composition - nice "thirds" and I like the catchlight in the eye. 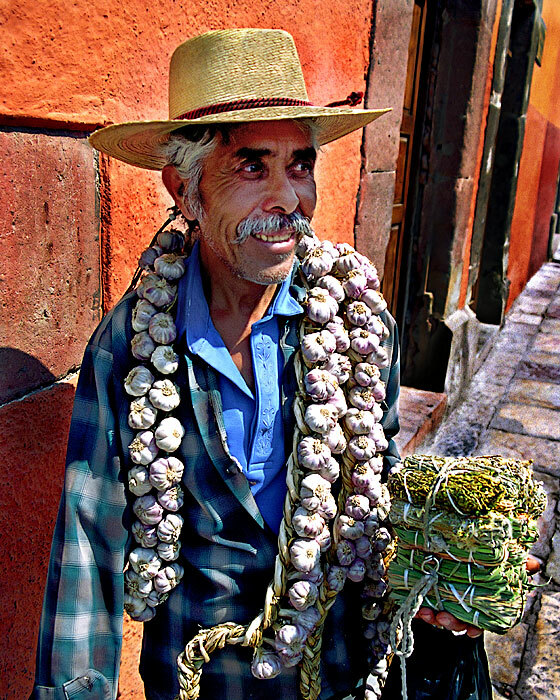 Tough exposure to deal with the face in the shadow and the garlic (which looks a bit blown out). There's also something sub-obtimal happening to the top of the stack of "stuff" in his hand. Maybe a little too contrasty or possibly oversharpened. Looks oversharpened and over saturated - but a nice shot, and I like it! I like the expression, the composition and the colors. All the main elements of a good photo are there. As others have noted, some of the textures and edges have an unusual appearance--perhaps due to oversharpening and/or heavy post processing to deal with the high contrast scene? I concur with the nits already picked regarding the blown highlights, but IMO the image works well in spite of the technical shortcomings. Fix them, and you have something worth keeping. Extending upon what has been said so far...for me there is to much brightness and contrast on the right of the image. As well as the garlic being blown out, the green stuff and the receding wall have way to much contrast and draw the eye away from the face into the resulting harshness of the subject. You may wish to tray selectively applying brightness/contrast and reducing both the brightness and contrast to the wall, street, green stuff and the garlic around the neck. As the eye has an affinity with moving to brightness, then contrast you need to reduc the brightness of the garlic and the contrast of the surrounding to ensure that the face gravitates to the face. i think it would make a good image if you can 'fix' the image so that the face is not lost in the noise. Thank you very much for your comments and suggestions, I still work with a film Canon Rebel and a 28mm to 200mm Tamrom lense. I have found out that I have to be very careful with my post processing or the image starts getting posterized very fast, I loved the sharpness of the strands of hair of the photo Jonathan posted, should I have faded the last sharpenig by 50% maybe? The spanish onions on his left hand and his hat were blown out white!! In my limited experience I have found out that an underexposed section of your image has some info left in there, overexposed areas are very hard to correct. In a situation like this should I have used a fill flash? Dia Azul brought a very good point since all that contrast and richness in the background is all me trying to avoid the overblown exposure of the street. Is all about balance and as he pointed out the eye should be drawn to the face not the background. I keep trying but if someone feels like they could play with it I would love to see the results. Which is why you should do all your post work in 16-bit mode. If your scanner doesn't support 16-bit scanning, get rid of it and buy one that does. It does, I need to upgrade Photoshop to be able to use more feautures in 16 bit, can you do layers in 16bit on CS2? Absolutely - only a small number of filters (eg smart blur) aren't available in 16bit mode. I suppose the thing that bothers me about the image is the perspective it was taken from. From the proportion of the subjects head and the lines of the street and building behind, it would appear that the camera/lens was looking down at the subject. This perspective carries with it certain emotional overtones of superiority when the viewer is looking down at person such as this. I feel that taking the shot from a lower position would have put the subject on the same level as the photographer and, therefore, the viewer. I think this change in position might also have produced a slightly more interesting background and would have lessened the angled lines of the wall.